When my kids were toddlers, if you asked them what city, state or country they were from, they would have answered Florida to all three questions. Right or wrong, it was a cute answer because they obviously didn’t understand the difference between cities, states and countries. Florida was more of a state of mind than one of the 50 states in the U.S. If you ask me where I’m from, I’m not much better at answering the question than a toddler. It’s certainly much less cute when I answer. I’ve moved around so much that I don’t know if I’m supposed to say where I was born, where I currently live or where I’ve lived the longest. The truth is that the best answer I can give is similar to a toddler’s answer. Since I’m from many different places, I’m from more of a state of mind than a state on a map. It’s like the saying, ‘home is where the heart is.’ My heart is in different places simultaneously. That’s just not easy to explain during small talk at a party. 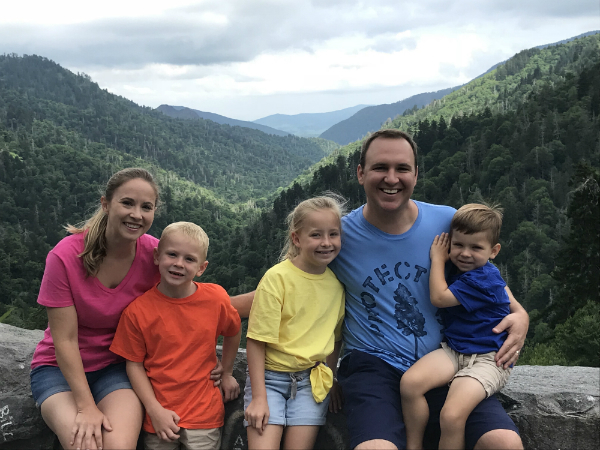 I haven’t lived in Tennessee since I was in first grade, but it’s the place that resonates the strongest as home in my ‘state of mind.’ I was born there and I’ve visited cousins, aunts, uncles and grandparents there nearly every year since my family moved away. When I return to Tennessee, there are always new neighborhoods, stores and road construction projects. But the protected parks stay the same, just as I remember them as a child. It’s why I like to go back to the parks and see the world not only as I saw it as a child, but as generations of families before ours saw the world. It connects me to my roots somehow. The sustained beauty of Tennessee is best experienced in the Great Smoky Mountains National Park. So last week, that’s where I took my kids from “Florida” to see, touch, hear and smell, but thankfully not taste, the place of their roots. 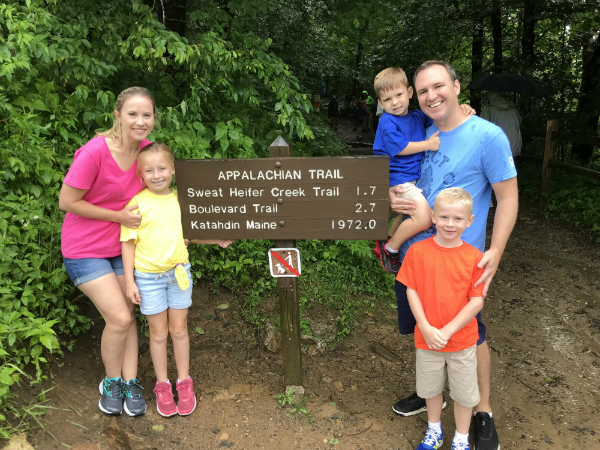 When you visit the Great Smoky Mountains National Park, it’s always tricky to know what to wear. The weather fluctuates from morning to night and it gets much cooler at the top of the mountains. Thankfully, Hanes dressed my family in comfortable clothes for the trip, from Nano T® V-Neck T-Shirts to colorful Nano-T® T-Shirts and Comfortblend® EcoSmart® Full-Zip Hoodies for the kids, and a graphic tee from their new apparel collection in partnership with the National Park Foundation for me. Luckily, nobody fell in a stream, so we didn’t need to change. 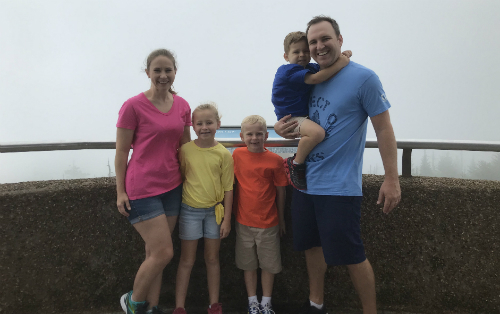 The one time I was tempted to add more clothing was when we got out of our minivan to start our climb to the top of Clingmans Dome, which is the highest point in the Great Smoky Mountains National Park, the highest point in Tennessee, and the third highest mountain east of the Mississippi. The air was very cool, even downright cold for a midsummer day, but it would quickly be appreciated. The light 100% cotton Hanes t-shirt was all the comfort I needed once we got started. 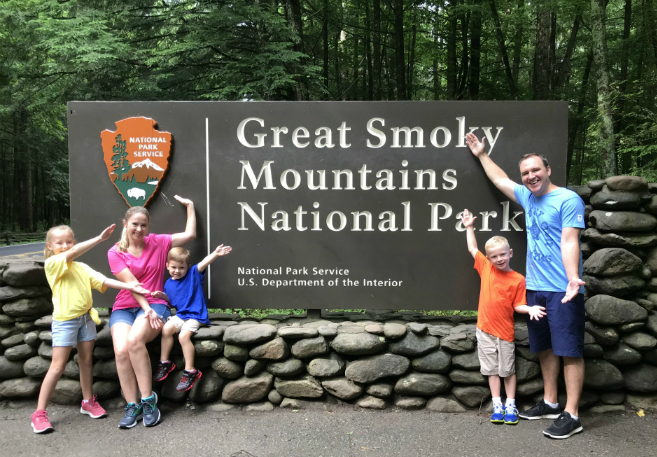 When we arrived at the Great Smoky Mountains National Park, we stopped at the Visitor’s Center to ask which sites we absolutely needed to see. Clingmans Dome was at the top of the park ranger’s list, as I thought it would be. But she warned me, it’s a steep climb to the top. I told her I brought a stroller for our four-year-old, and she just laughed. 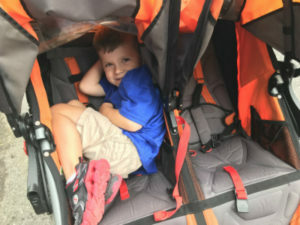 They didn’t ban strollers from the path, but they strongly recommended against them. An hour later I would find out why. When our family started the climb, people walking down the mountain laughed at me in the same way the park ranger did. They knew I was going to have a tough push to the top, because it’s already a hard walk without a stroller. Thank goodness the summer weather at the top of the mountain was cool or I would have had a stream of sweat running down me with a stronger current than some of the streams in the park. After a few stops to sit down and catch our breath, we finally made it to the top. Victory! Perhaps the most amazing part was the kids didn’t complain on the way up. Granted, the youngest one was sitting comfortably in a stroller. But usually at least one of the kids finds something to complain about. I think the beauty of the mountains was more than they expected. Every step we took was a step closer to the clouds. And when we reached the top, we were in the clouds. 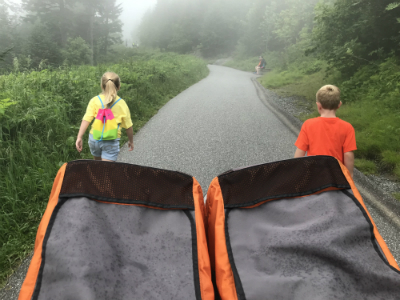 The visibility wasn’t great if you wanted to see long distances, but our kids were enjoying what was right in front of them. I think they thought it was even more awesome that we were walking in the clouds. When somebody asks my kids now where they are from, they can tell you our exact address, at least the oldest two kids can. 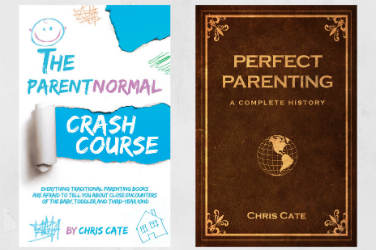 Our four-year-old would be a mailman’s worst nightmare. 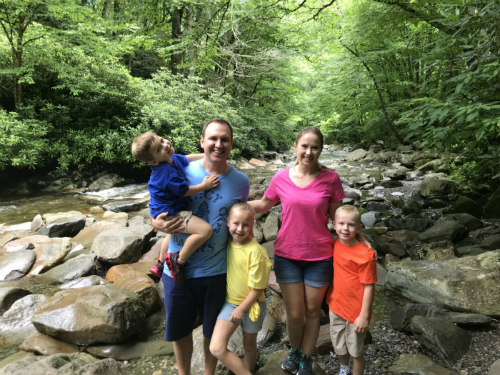 But after our experience in the Great Smoky Mountains National Park, I know they’ll always share another home with me that can’t be placed on a map. And that’s because it’s in their hearts and literally in the clouds. 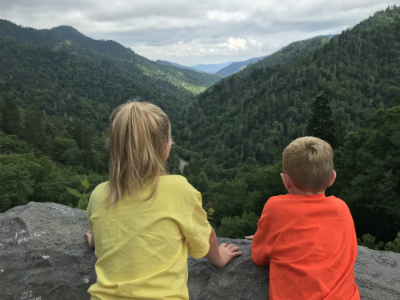 Someday, I hope my kids will take their kids to the Great Smoky Mountains National Park, as well as other national parks. It’s comforting to know that because the parks are protected, they will always be just as beautiful as the first time they saw them, I saw them or even early American frontiersmen and the Native Americans before them saw the land. Thanks to Hanes for sponsoring this post. It’s so cool that the National Park Foundation and Hanesbrands are partnering to inspire people from all backgrounds to connect with, celebrate, and support America’s national parks and community-based programs. As one of the newest National Park Foundation partners of the Find Your Park/Encuentra Tu Parque movement, Hanesbrands is helping to protect America’s national parks. 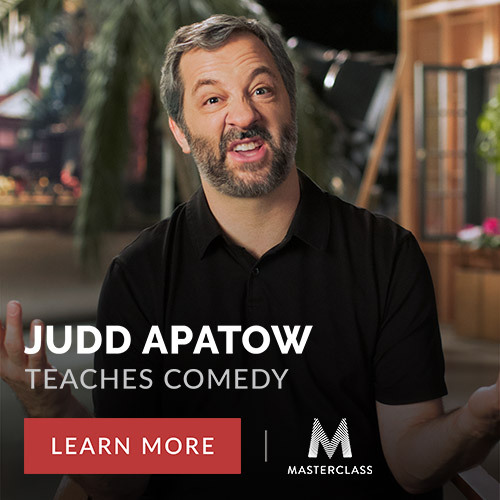 Learn more about the partnership here.